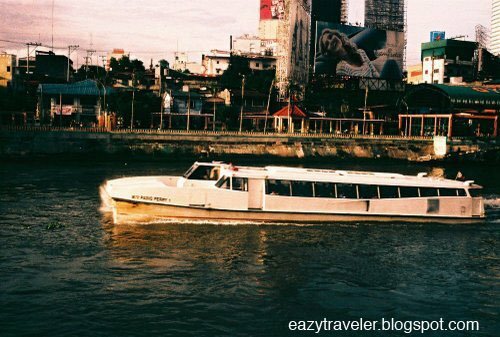 One of the most wonderful additions to the metropolis is the revival of the Pasig River Ferry which, since its inauguration in February 2007, leisurely takes passengers to and from the heart of Old Manila… through the Makati Central Business District… up to the outskirts of Pasig City, and eventually northwards to the shoe capital, Marikina City. Sure, this may not be a trip down the Seine, but a cruise through the city’s first highway aboard these air-conditioned catamarans provides a unique perspective of Metro Manila, comparable to those found in other Southeast Asian capitals like Bangkok. 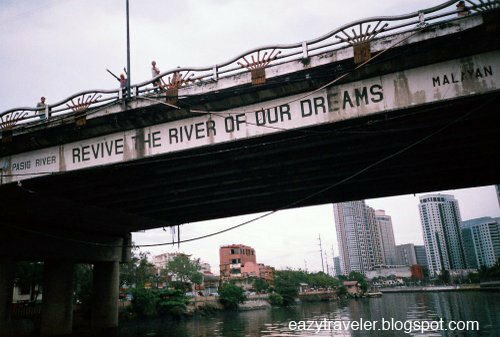 Where the stark and compelling ironies of Manila are slowly unraveled: shanties and skyscapers, consumerism of fashion billboards and the poverty of the slums, the survival of a multicultural past amidst the staggering progress of the new. 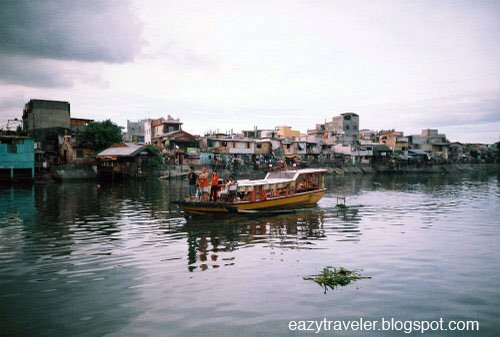 Rediscover the significance of the river–the lifeblood of early Manila–which gave its local inhabitants their name: taga-ilog or tagalog, meaning people of the river. 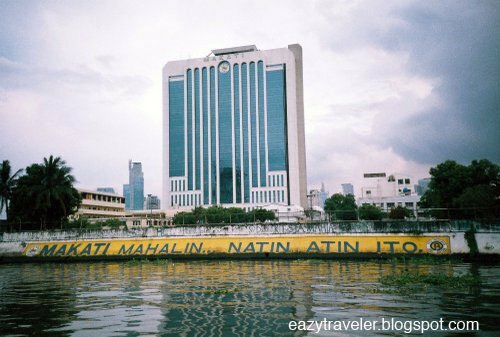 An hour-long trip from Guadalupe to Escolta or Plaza Mexico offers a new perspective on some of Metro Manila’s outstanding landmarks, as the ferries meander through sooty archipelagos of drifting hyacinths and squawking seabirds. Most of the riverside squatters have been relocated, providing interesting views of Rockwell Center, Makati City Hall (pictured above) Malacañan Palace (Note: Photographing the presidential residence and its environs is strictly prohibited), the beautiful Post Office Building (pictured below), old structures of Binondo like El Hogar Filipino, the historic walls of Intramuros, and the many bridges that span the snaky body of ebony water like the Jones Bridge (pictured below). 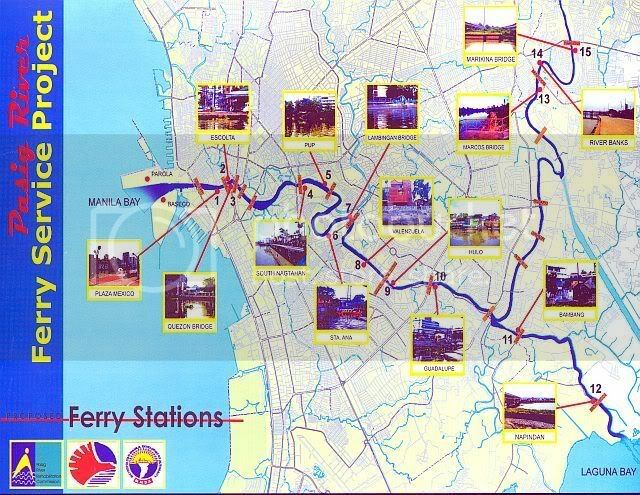 Fifteen stations mark the river ferry route. See map here. 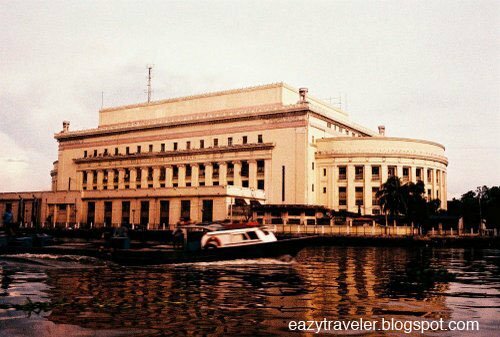 A recommended trip is one to and/or from Guadalupe or Hulo (across Rockwell) in Makati City to one of the Old Manila stations: Quiapo (Quezon Bridge), Escolta (a short walk to Chinatown) and Plaza Mexico (Intramuros). Rates are from P25 to P45, with discounts for students and Sunday trips. The ferry operates daily from 5:30 AM to 9:00PM. The windows inside are wide, but to take better pictures, stay outside on the deck, where the sightseeing is occasionally stirred up by the bearable whiff of brackish river stench. 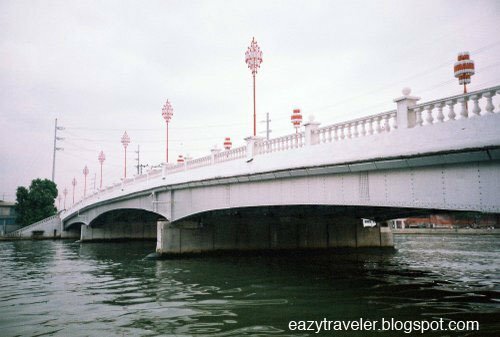 However, it’s not at all stinky as people imagine it to be, especially during the rainy season. Lovely post! Funny how our backyard attractions are the ones ignored the most often. Thanks for this eye-opener, will try it out soon.